Gorging yourself silly in OZ doesn’t mean what you’re probably thinking it means. For a start, I’m not even talking about food – although you haven’t lived until you’ve eaten at a fine OZ bakery – but I digress! Not that that’s a bad thing – there’s something about gorges that draws you down the depths in a sometimes taxing reverse-mountain-climb! At the bottom, there’s another world that just invites you to rock-hop, swim or canoe along the inevitable river bed, explore the geographic features – rocks, waterfalls, caves – and photograph the rim against the sun. Or is that just me? It’d be a rare person who’s visited all the gorges in OZ – I’m not even close! But I’ve explored quite a few over the years, so here’s a starter menu of 10 random ravines recommended by Red! They’re not the only – or necessarily the best – in OZ. But you can’t go wrong with these! Hiking the floor of this remote outback gorge isn’t an option. But hire a canoe and dodge the freshwater crocodiles and file snakes (I nearly hit one with my paddle) before using the portage to get to the upper gorge! Swim with giant catfish, bathe in the falls or hike to the rim for the reddest rock you’ll see almost anywhere! This magnificent gorge, often overshadowed by the (relatively) nearby – and better known – Uluru, starred in the OZ modern classic film ‘Priscilla, Queen of the Desert’. While Pilchard and I weren’t tempted to re-enact the famous ‘co*k in a frock on a rock’ scene where three drag queens ‘do’ the gorge, the rigorous circuit track rewards hikers with some of the most magnificent views in OZ! Impressive walks through stunning scenery, Central Queensland’s Cania gorge has it all – killer hikes, remnant rainforest, rocky walls, fantastic views, bushranger caves and a mighty dam nearby for fishing. It’s been too long since we visited this fabulous spot with kangaroos and potoroos in the campground, and platypus in the creek. The spine-tinglingly bloodcurdling shriek that rent the night air wasn’t a woman being murdered either – that’s exactly what Barking Owl sounds like! With any luck, the heavy rain that ended Victoria’s 10 year drought in early 2011 and closed this spectacular gorge hasn’t caused permanent damage. A favourite northern Grampians hike, Peregine Falcon’s wild, sad call ringing out high above the rugged river bed always gives me goosebumps. In a good way. If I’d known the last time we walked the circuit track might be the last time we EVER walked it, we’d have taken it more slowly – and taken more photos! The granddaddy of them all, a journey through magnificent Brachina Gorge in Outback South Australia is like tripping in a time machine through aeons of geological activity caused by weathering, erosion and time. The awesome scenery is pretty spectacular as well – with an almost unbeatable Scenic Public Toilet! Red hair, white sand, black clothing, blue skies, green foliage, red rock. What’s not to love about this photographer’s fantasy in the depths of Central Australia? 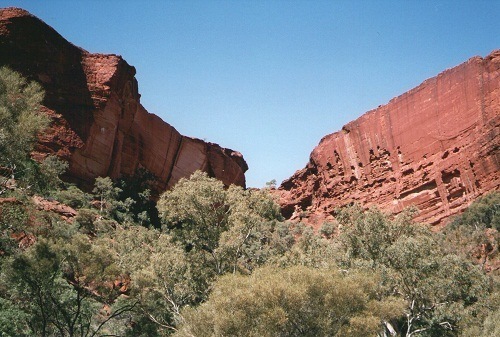 One of several gorges in the region, Trephina Gorge Nature Park epitomises the Outback’s harsh, unforgiving landscape while emphasising its rugged, wild beauty. One of the better opportunities for that valued rocky-walls-against-blue-sky shot, Carnarvon Gorge’s walking trail is reasonably easy going – if you don’t count the length ! A ~20 km round trip – if you don’t count the detours to chasms, gullies and Indigenous art!! Platypus in the creek and a spectacular setting put this amazing gorge well and truly on the tourist trail. Except for an hour in the middle of the day, this deep, narrow gorge near Alice Springs in Central Australia is mostly in shadow. But when the sun’s directly overhead, the magnificence of the rich red glow on the steep, rocky walls towering high, high above is unparalleled! The megafauna once roaming this region now sadly long absent, there’s no distraction from the magnificent scenery of this spectacular spot. Exploring the ever-eroding red river banks (yes, the name is SO imaginative! ), and walking the gorge shows the savage beauty of this untamed, arid landscape. But my favourite bit? When Red-capped Robin comes bob-bob-bobbin along!! The achingly beautiful and haunting sound of our Aboriginal guide’s didgeridoo echoing through a cave and across the water is a highlight of this guided tour – the only way to see awesome Katherine Gorge, deep in the heart of the Northern Territory. Exploring this ancient and mystic landscape is a privilege not to be missed! And these are just 10 of the gorgeous gorges (c’mon! you KNEW I had to throw that in!) downunder in OZ to which I’ve been! Imagine what’s in store in the parts I haven’t visited yet?!?! Don’t know about you, but I can’t wait!!! @Dalene – pick a gorge, ANY gorge … (well, almost) for a few of your favourite things! All I could think about was hiking and kayaking – two of my favorite things and it looks like an ideal place to do it! Excellent – this was my first gorge list! @Andrew – Yes, she cracks me up too – geddit??!! Ah … THAT way! You make it sound so appealing I can’t imagine why I’m not rushing there immediately! @Kate – Yes, you really CAN have too much of a great thing … glad to ‘meet’ you too! @Friko – not to mention an ongoing lesson in how to photograph gorges!!! The more you show me of Oz, the more awed I become. This is a lesson in geology and prehistory all in one. Hello! Lovely to blog meet you. Great blog. We are also lovers of the great Aussie gorge but I have to say I did over hear my eldest telling one of her school friends recently that she is ‘gorged out!’ Lucky we’ve ,ainly got beaches on our itinerary between here and home. What great photos! We are looking forward to spending 3 months out past Stanley Chasm next winter / spring at Hamilton Downs Youth Camp. @Joan Elizabeth – Well … Brachina is a good start! But not the only good one at Flinders Ranges!! Can’t wait to see where you end up! @Mary – I’m SOOOOOOO sorry!! Maybe you could co-opt someone else to check it out for you and tell you the good bits??!! @Michael – Haha! That’s what I thought too!! @Keith – 3 months! That sounds wonderful … but you’ll be all gorged out by then for sure!! Shucks I have some gorging to do. Brachina is the only one on your list I have seen. @Sallie – I think there are definite similarities with your arid zones … why not come on down and decide for yourself?! @Lux – Wish hard enough and you can make it happen! It IS diverse – no chance of getting bored! @Jayne – I didn’t realise I had so many pix of gorges until I started looking … would you believe I didn’t include all the ones I’ve ever been to?? @NJAMB – Weird how I thought my blog would be all about the writing when I first started … now it’s the pix that take centre stage! You might be right about the common geological history – one day we’ll both find out!! @Jan Ross – I’m the world’s biggest coward, so if I survived, anyone can!!! It’s just a matter of priority – if you really want to see it, you’ll put up with the ‘inconveniences’!!! @Sophie – AND many more to come! @SFlaGuy – I’m counting the minutes … and what makes you think I don’t already have a mobile outhouse??!! @Kath – hahaha!! And I bet each one who said it thought they were the first … happily RNO doesn’t really lend itself to such things! @Beach Bum – Well … wishing’s the first step, right? All that’s left to do is GOYA! @River – But wait! There’s more!! When I get to ‘I’ you MIGHT change your mind! Beautiful post — we love to visit country (sort-of) like this in the American southwest — Utah, Arizona, Colorado. Gorgeous pictures. Wow! The rocks at Standley Chasm look very similar to some that are in New Mexico. I wonder if they were formed the same way? Ooh, so many gorgeous places in Oz I haven’t even heard about. OK, you almost lost me when you talked about the freshwater crocodiles (at least they are not the more deadly saltwater ones!) and almost hitting snakes with your paddles, but you got me back with the beautiful photos. Have to make it to Australia one day! I love how diverse the landscape is in Australia – I just wish I was back there.. Thanks for sharing them with us! Oh you just wait till I get home and post my next posting. Hopefully before you wake up down under to see it. It will make you wish you could afford to have your own mobile outhouse to tour the these magnificent places in comfort and style just like an American. The really rich ones. Not me. I blew my little fortune at the slots two postings back. I am in awe Red.. Yourself and Pilchard are explorers ‘extraordinaire’, intrepid adventurers fearless and brave!! On top of that you are such a great ambassador for the Australian outback! Thoroughly enjoyable post once again. It is supposed to be “winter” in Canada and it is so mild I am in shorts n tank today?? WADDUP WIT DAT?? Our gorges are the best part of Australia, equalled only by our wide, wide beaches. Have not done any hiking in a long time, but you got me wishing I could head out into the wilderness. Beautiful pics and observations, RedNomadOz. We Aussies love a good gorge, don’t we? Having the full name of Katherine and spending a couple of years living in the Top End, however, did give a few yokels the chance to say, “Show us yer gorge, Kath.” Er, quite. What wonderful photos of these amazing rock formations. I haven’t seen any of these yet so I will have to step up my travelling. I visited some amazing rock formations near Mudgee and you have inspired me. I think I will borrow your idea and write my next post about those. Thanks Red. @Leanne – There’s plenty more I didn’t put in this post + the whole of WA that I’m yet to ‘do’ properly!!! @diane b – I’m sure the road to Lawn Hill is actually sealed for part of the way now … but whether it is or not, it’s SO worth it! But I bet u can’t get a Ned Kelly pie in a Swiss bakery!! 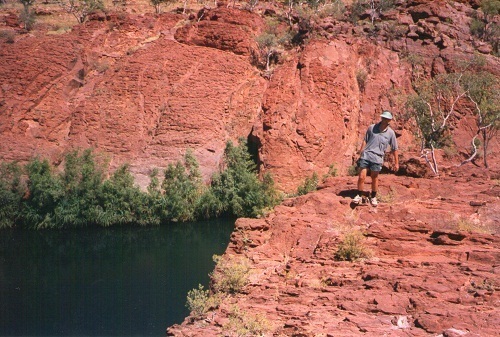 @Rubye – Despite all the people in the Cania gorge campground, P&I were often the only ones on the walks. I can’t believe I didn’t take more photos of it! And you’re right – its beauty comes from a quieter place than many of the others! Although the hikes can be killer!!! @Nikki – I look forward to reading about the Mudgee gorges, and your future posts about the other ones you’re yet to visit!! @MJWC – Yep, I rarely write about places I haven’t been … and I’d go to all these again in a heartbeat! @Andrew – No crox in the Grampians – yet!!! Haven’t been to your one either – where is it?? They are all Gorge-ous. LOL..
You always have such amazing pictures, and to think… you have been to them all. Okay. To see all of the things I have listed from your posts, I will now have to stay in Australia for a year! A year! And I probably won’t be able to see all of them in that time!!! Wonderful post today. Amazing scenery! Amazing country! Sigh, so many places to go, so much to experience. In the meantime, your stories and photos are definitely the next best thing. Gorgeous gorges. I didn’t realise how many we have and how many I have been to. 6 out of your 10 plus lots in the Kimberley. Lawn Hill is on my bucket list. Some of our bakeries are nice but you can’t beat France and Switzerland for bakeries. @Windsmoke – Yeah! We’re SO lucky! @Alessandra – Lawn Hill is my fave also! AND … happy to give you a list of bakeries – just tell me where you’ll be visiting!! @Mark – And we’re so lucky to have them AVAILABLE to visit!! 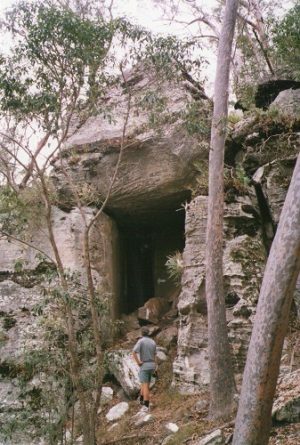 My Carnarvon Gorge visit was in 1998! @Magsx2 – just something about them, huh?!?! @Manzanita – Hahaha!! And I’ve NEVER been described as a centrefold before … makes me even more determined never to post a close-up! By George, each gorge IS more gorgeous than the last. You are right. Golton Gorge is especially gorgonizing with Red in centerfold. The rocks look like little round dips have been scooped out, here and there, with an ice cream scooper. Great photos, and wonderful places to visit, the scenery is just spectacular. Carnarvon Gorge is spectacular. Was there 30 years ago, one day I will return. Red you are so lucky to have visited all these places. Once again another Bonza post ‘n’ photos of our spectacular Aussie landscape, there’s definitely no other place quite like it anywhere :-).